Cast: Kim Sang Joong, Yoon Kyun Sang, Chae Soo Bin, Kim Ji Suk and Lee Ha Nui. Ah Mo Gae (Kim Sang Joong) is a slave, living and working for a nobleman, with his wife and two sons. Their lives are a common slave life, and as life goes, Ah Mo Gae soon notices that being a slave not only halts his life, but limits any hope of a future besides being a slave for his two sons. Even though he is a slave, Ah Mo Gae has the mind of a business man which his owner uses for his advances, and every single time Ah Ma Gae is to be set free, the nobleman finds a way to postpone it. His sons start to realize themselves what it means to be slaves, as the oldest Gil Hyun isn't allowed to read and the youngest Gil Dong is forced to keep his opinions at bay. Soon Ah Mo Gae realizes that Gil Dong isn't just your regular child, as when he gets upset he becomes unnaturally strong. Even though Ah Mo Gae does everything he is able to, so that Gil Dong's powers aren't known to anyone, destiny has other plans and the family ends up having to run for their lives. As a grown-up Gil Dong (Yoon Kyun Sang) has changed: he cares more about girls and how to earn easy money – much to his fathers' dismay. Ah Mo Gae on the other hand has become a leader of an outcast group of people outcasts like him, dealing with illegal trade. I was waiting for this drama the moment I had heard it was in consideration: at that time the leads weren't even chosen – but I was 100% sure I was going to watch it. This story is one of my favorite stories of Korean literature, due to its creativity, but also because of historical accuracy. Even though this isn't exactly like the original novel, it is very close to it – and the fantasy aspect is also great and fits the story perfectly. Yes, it might be different, but the moment you accept it, it becomes such a nice way to portray the strength of Hong Gil Dong. Another thing that was amazing was the lead couple: I don't remember watching a couple which fit better than these two – even though 'how' they got together might not be great, but the relationship that 'happens' is a delight to watch. 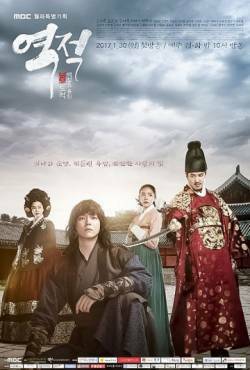 The only reason it isn't a 5 stars, it because of the crying scenes of Kim Sang Joong – which you'll have to watch on your own to understand. But that is also it. Honestly, I don't know how to not spoil anything, and how to explain how much I enjoyed it, without ruining it for you or make you over expectant, except saying: I recommend this drama. To sum up: an awesome drama with great acting, and amazing story.